Tell us a little about the history of your city’s drinking culture. When Vietnam was a French colony the drinking culture of the south started with coffee and beer then later moved to sugarcane juice. In 1954 America came to support the south of Vietnam and bars and pubs were opened. These days young people mostly prefer popular street drinks such as sugarcane juice (Nu’ó’c Mía), swamp pennywort/centella (Nu’ó’c Rau Má) & coconut juice (Nuróc Du’a) while middle aged people prefer coffee and the rest love tea. When did the city get into cocktails – or is there still a way to go before we can say there is a cocktail culture? Probably the city got into cocktails back in the 1990s when the Saigon Floating Hotel came to Vietnam and became the first five-star hotel in our country. It’s also renowned as the first floating hotel in the world. Who and what are the pioneer bartenders and bars? Let’s talk about the bartenders. I would like to mention Henry Pang (Singapore) and Vo Tan Si in the south of Vietnam, who is responsible for the Saigon Bartenders Guild. I would like to introduce Nguyen Xuan Ra, who is the oldest bar trainer in the centre of Vietnam at over 80 years of age. Last, but not least, I am a bit ashamed to mention myself. 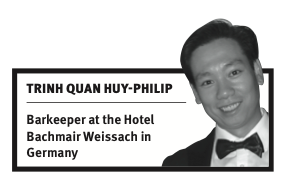 Yes, I am Trinh Quan Huy-Philip from Saigon, Vietnam, a well- travelled and leading young bartender in my country. About the bars, I have to speak about the Saigon- Saigon, which is the rooftop bar of the Caravelle Hotel. This iconic bar has been welcoming patrons since 1959 and was a popular spot with journalists in the 1960s. Of the rest: I would recommend Q-Bar, which is in the Opera House, facing the Caravelle Hotel. Where do you think the city ranks in terms of bar scenes in its continent? Actually, the city which is most influential in Asia is Singapore. Back in 2000 representative offices of wines and spirits companies opened in Vietnam, such as Maxxium. Now people have more chance to travel and visit other countries so we are trying to develop by ourselves. Do economical shifts affect cocktail consumption? Well, economics could be part of it but I don’t think cocktail consumption is at an all-time high. People who love to drink cocktails mostly don’t have much money to spend on their night out. On the other hand, people who aren’t interested in cocktails can spend more money in a discotheque or club ordering by the bottle.